Two of the most common methods for paying off debt is the Debt Snowball and the Debt Avalanche. Neither of these methods are superior to the other. They both have great qualities and offer excellent motivation for getting rid of debt. The Debt Snowball is the method Dave Ramsey recommends. When using the Debt Snowball you will list your debts in order from the smallest debt to the largest. While continuing to make minimum payments on all debts, begin actively trying to pay off your SMALLEST debt FIRST. This will mean that you will use ANY extra money that comes your way to paying off this one debt. The reasoning behind the Debt Snowball is while starting small, you will gain confidence and traction. As you pay off those small debts you will have more practice and motivation to be able to tackle the larger debts. Pay off the credit card first, while continuing to make minimal payments on the other two debts. Next you will pay off the car loan, and then lastly you will tackle the student loan. In the Debt Avalanche you will list your debts in order from the highest INTEREST to the lowest interest. You will then continue to make all minimum payments for all debt while focusing all extra cash to paying off your debt with the highest interest rate. The point of the Debt Avalanche is that by getting rid of the debts that charger higher interest you will be able to pay off the debt quicker. 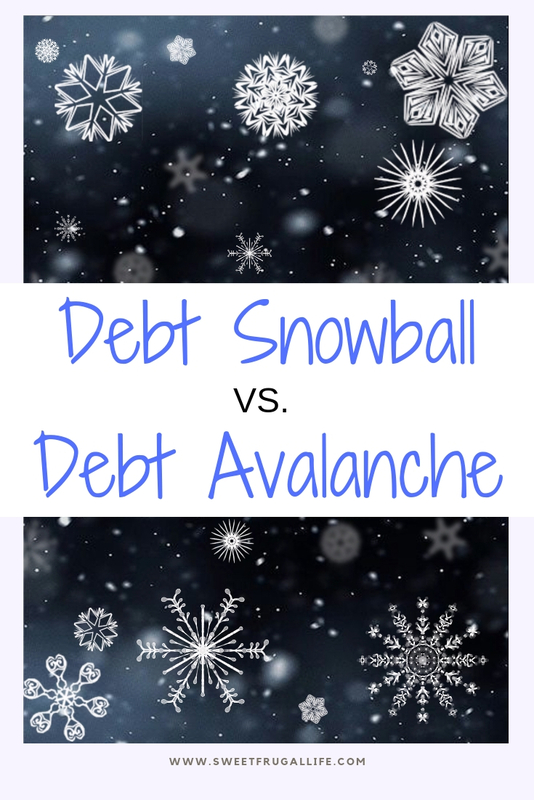 The Debt Avalanche WILL have you spending LESS money overall than the Debt Snowball. If following the Debt Avalanche method you will pay off the credit card first, followed by the student loan and then you will pay off the car loan. Soooo……what does this all mean for you? The answer to that question will be personal. It will be different for everyone. There is no RIGHT or WRONG method. If you are feeling overwhelmed and unsure of yourself, then perhaps the Debt Snowball would work best in favor. It helps you start small and gain quick wins at the beginning. If you are feeling super motivated and you want to get rid of that debt ASAP, then you might prefer the Debt Avalanche. This method will get you aggressively paying off that debt and will cut out some of those interest costs. I personally recommend you research, research and more research. Study everything you can about both the Debt Snowball and Debt Avalanche. Once you have studied everything you can, make your decision. You will naturally feel more comfortable and be drawn to a certain method. Once you make the decision best for you, GO WITH IT, own it. Do everything in your power to get rid of that debt. Check out the article What we cut from our budget to save over $2500 a year, for a few ideas on finding some extra cash in your budget. I promise paying off debt WILL be hard…..but I also promise that your future self will THANK YOU for being willing to put in the work. I mixed things up in my pay off. I used the which payment is the highest to free up cash. Then went to the snowball and now I am doing the avalanche method. We just have the house and a car to pay off. Car was not an intended purchase but it happens. I love the idea of mixing things up. You’ve gotta do what works best for you!